Living in Bozeman, Montana as an impoverished 19 year old musician/music collector can become quite tiresome. I rarely have the means to spend more than ten dollars on anything, let alone rare LPs worth upwards of $100. I have learned though, that even in a place as culturally devoid (sorry) as Bozeman, the trick is to be patient whilst combing through the endless minutiae of second hand music. This Easter I reaped some serious audial fruits. Not of my half-arsed attention span, but my boyfriend’s insane powers of observation. Diligently flipping through a pile of musty record sleeves, Eric’s hands unearth a VERY special find amongst the dark, gorgeously cluttered troves of East Main Trading. Here, in southern Montana, crammed in a pile of forgotten Whitney Houston and Dan Fogelberg albums, lies the magnum opus of electronic composition. Bruce Haack’s Electric Lucifer. The front cover depicts a watercolour, cartoonish Satan smiling benevolently over two smiling pastel demons. It’s not sinister at all, for once Lucifer looks like kind of a nice guy. One would assume that the face behind the music (an incredibly strange man as we’ll find out) employed such imagery for contrarian purposes, maybe to protest Christianity or pop music of the time. Such is not the case. Staring at this magnificent piece of Moog genius, I could not care less about the peeling cover, as Bruce Haack’s manifesto on the back is still completely legible. He exclaims the use of mildly Satanic themes triumphantly: “A primary function of The Electric Lucifer is to help end war- and hate- and pain and fear. The God I want mankind to walk with hand-in-hand is so full of love and genius that even Lucifer, the eternal underdog, will be forgiven.” Well said, dude. For those of you who don’t know, Bruce Haack proved to be an indisputable mastermind; Inventing a keyboard synthesiser powered by three 9 volt batteries, and a modulator controlling the wave-form of sounds ran into it, also powered by the same batteries. These technical feats were just for this 1968 masterpiece. According to Haack: “To past generations the Bible could justify both love and war, today we must know it as love-bearing truth dialectic.” Among his compositional contributions, Haack created his own synthesizer robot that would play music for people, the first digital sampler in musical history, and a motion controlled vocoder! IN THE 1960S. The man was bloody brilliant. Perhaps his most fascinating feat, Haack also released 13 albums of electronic music for children, even making a legendary appearance on Mr. Rogers, as he believed music to be an incredibly powerful tool for educating youth. He enforced that music could be expanded beyond traditional means, holding the power to educate, enlighten, amuse, and unite. As aforementioned, this beautiful mountain town can be occasionally depressing to melodramatic teens hungry for the obscure. Alas, there are musical gems waiting to be unearthed from seemingly bland cultural soil. I could sell my copy of The Electric Lucifer for about $100. I bought it with 12 quarters from a confused looking, endearingly wrinkled man wearing a cowboy hat and tobacco-scented drawl. I will never sell this LP, and will play it constantly, as Haack intended. East Main Trading inadvertently reinforced my love for experimental material, and essentially made me appreciate Bozeman again. After such a marvelous find, my optimism is replenished and stronger than ever! I will continue my pretentious quest for music that very few Bozemanites give a crap about, and remain thankful for the phenomenal local businesses this quaint place has to offer. For those who would like to learn more about Bruce Haack, there is an excellent 2004 documentary on his life and work called Haack: The King of Techno. Birdie Hall is a student at MSU studying Philosophy and English Literature. 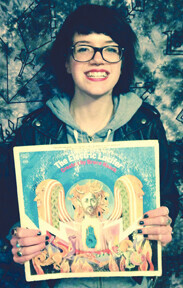 She enjoys abrasive music and spending time with her cat Simone. Indisputably, the godfather of American Punk has to be Jello Biafra, lyrical genius behind the Dead Kennedys. Amongst this mildly terrifying period of civil unrest, there is an album that has been playing on repeat in my head, vying for my attention and a call for action. Society as we know it has entered an era of inescapable false-representation and the total commodification of everything.